Wofford guard Fletcher Magee could be a tournament star. True to the reputation of an overlooked mid-major, when the Wofford Terriers were headed for the Southern Conference tournament earlier this month, they refused to take anything for granted. As dominant as the Terriers were, the persistent refrain from Spartanburg, South Carolina, was that Wofford would not feel safe on Selection Sunday without a tournament title and an automatic bid to the Big Dance. Those worries were built on years of heartbreak from small schools whose surprise losses in conference tournaments nullified dominant seasons. No team from the Southern Conference has been given an at-large bid to the NCAA Tournament. Despite finishing the regular season 26-4 and ranking 14th in the NCAA’s NET metric, Wofford was vulnerable. But the concern proved to be unnecessary. Wofford defeated its three conference tournament foes just as it won its 18 regular-season league games, and based on the way Sunday went, it wouldn’t have mattered anyway. This is no ordinary mid-major underdog. It’s official now: Wofford is going to the NCAA Tournament as one of the most dangerous mid-major teams this century. A No. 7 seed in the Midwest region, the Terriers are a rare breed of March upstart. They are the highest-seeded Southern Conference team since the NCAA Tournament expanded to 64 teams in 1985. Other than powerhouse Gonzaga, just five schools this century have earned top-eight seeds in the NCAA Tournament from conferences that had played fewer than three tournament games per year.1 They are Pacific, Murray State, George Mason, St. Mary’s (twice) and Butler (four times). Tiny Wofford has posted a 118.5 adjusted offensive efficiency, better than all of those high-seeded mid-majors except St. Mary’s in 2016-17. The Terriers’ No. 19 ranking in Ken Pomeroy’s metrics indicates that they’re actually underseeded. In fact, they resemble the profile of the most famous Southern Conference darling, a Davidson team with a star shooter named Stephen Curry. Entering the 2008 NCAA Tournament, Davidson was 30th in adjusted offense, 25th in adjusted defense and 18th overall. Today, Wofford is 11th in offense, 63rd in defense and 19th overall. Davidson finished 27th in effective field-goal percentage, while Wofford is fourth. Neither team went to the foul line much — Davidson was 332nd in free-throw rate; Wofford is 303rd — but both compensated by limiting turnovers, taking lots of 3-pointers and making a high percentage of those threes. Both teams ran the table in the SoCon. Sunday was kind to little guys everywhere, from Wofford to Buffalo (a similarly threatening No. 6 seed in the West) to Belmont (which earned an at-large bid from the Ohio Valley Conference). But no team has Wofford’s combination of firepower, efficiency and relative obscurity. Mid-major conferences have had looks at the top 20 in Pomeroy’s rankings — Wichita State from the Missouri Valley in 2014, San Diego State from the Mountain West in 2011 — but even in that company, Wofford and the Southern Conference would be considered lower-profile in every way. In the NCAA’s 2016 revenue distribution based on tournament success, the Southern received a smaller share than any other conference except the Big Sky, with which it tied at $1.56 million. The conference with the biggest share — the Big Ten — received $25.82 million. The Terriers have been to the tourney before, positioned as a double-digit seed underdog in 2010, 2011, 2014 and 2015. In 2010, they were tied at 49 against No. 4 seed Wisconsin with 1:17 left. They didn’t score again and lost 53-49. In 2015, they were tied at 53 with No. 5 seed Arkansas with 1:55 left. They didn’t score again and lost 56-53. Mike Young’s team has since developed into one that’s built to pull off an upset or two in the next couple of weeks. 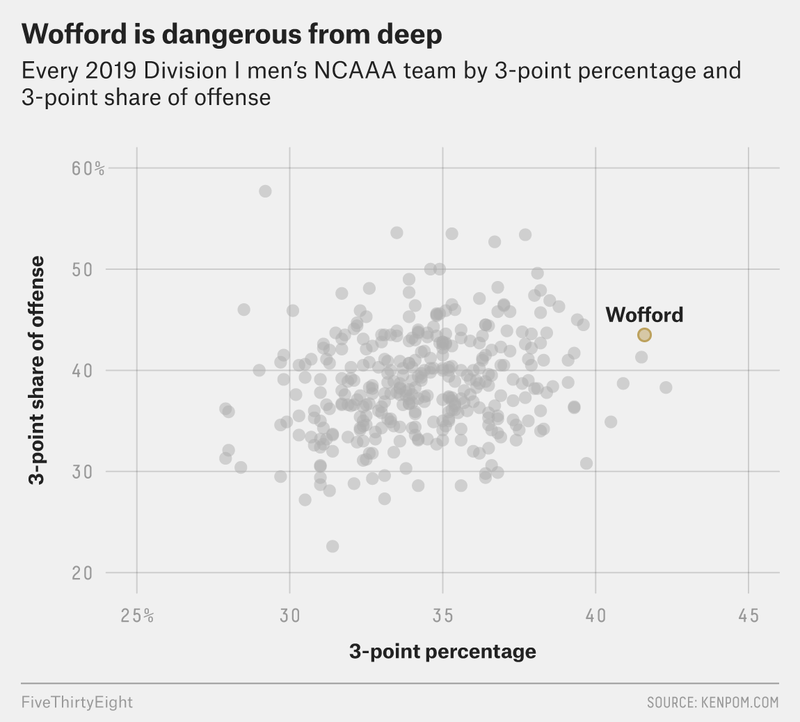 Wofford has followed the collegewide trend of increased reliance on the 3-point shot. The Terriers are second in America from 3-point range, shooting 41.6 percent, and 43.5 percent of their shots are from deep. Since 2002, only two tournament-bound mid-majors shot a higher percentage from three than Wofford did this season. In 2012, Doug McDermott and No. 8 seed Creighton knocked out Alabama before running into top-seeded North Carolina, and in 2010, hot-shooting Cornell made the Sweet 16 as a No. 12 seed after upsetting Temple and Wisconsin. To power that offense, Wofford has a shooting threat capable of being a star in this tournament: Fletcher Magee, who’s just two 3-pointers shy of the all-time career record for made threes. Every March explosion needs a spark, just like Creighton had McDermott, Davidson had Curry and Murray State had Isaiah Canaan in 2012. Magee’s work ethic has become mythical in Spartanburg, where they tell tales of the guard who practices in the dark to work on his feel. He once shot in his driveway in the middle of the night, setting cushions under the hoop to muffle the sound. As for any comparison to the other hot-shooting SoCon star? “I don’t like to compare players,” Young told The Athletic in 2017, “but in terms of Fletch’s ability to score and do it as efficiently as he’s doing it, from all points on the floor, let’s just say it reminds me of someone.” The mid-major energy and the streaky shooting are familiar, too. The history of mid-major success in the NCAA tournament is what makes March Madness so special. Loyola of Chicago became the latest stunner last season when it reached the Final Four as a No. 11 seed from the Missouri Valley. If Wofford makes a similar run, nobody should be shocked. This excludes the ACC, SEC, Big 12, Big Ten, Pac-12, Conference USA, Big East/American Athletic, Missouri Valley, WAC and Mountain West.